Democrats have already agreed to fund the government at Republican levels. Despite what you might have heard, there have only been two serious government shutdowns in recent history, and both were the result of Republican ultimatums. Democrats in the Senate have been begging the House to negotiate over the budget for the past six months, but Republicans have refused. That’s because Republicans wanted to wait until they had either a government shutdown or a debt ceiling breach as leverage, something they’ve been very clear about all along. Republicans keep talking about compromise, but they’ve offered nothing in return for agreeing to their demands—except to keep the government intact if they get their way. The public is very strongly opposed to using a government shutdown to stop Obamacare. 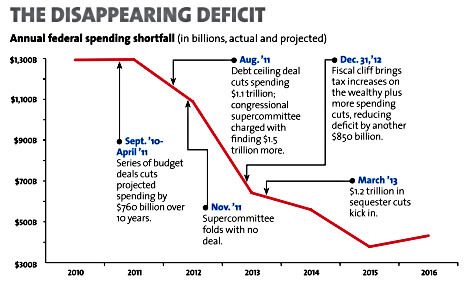 Contrary to Republican claims, the deficit is not increasing—it peaked in 2009 and has been dropping ever since, declining by $200 billion last year with another $450 billion drop projected this year. A long government shutdown is likely to seriously hurt economic growth, with a monthlong shutdown projected to slash GDP in the fourth quarter by 1 percentage point and reduce employment by over a million jobs. No, Democrats have not used debt ceiling hostage taking in the past to force presidents to accept their political agenda. This whole dispute is about the Republican Party fighting to make sure the working poor don’t have access to affordable health care.